Sixty Minute Poet by Forrest W. Heaton (broadcast 9-16-2013) This program is the inauguration of Carolina Book Beat’s “Focus on North Carolina Poetry”, guest-hosted by Sara Claytor, well-known NC poet. ( find out more about Sara here.) The third Monday of every month Sara will introduce listeners to a poet and poetry from the wealth of talent that we are so fortunate to have surrounding us. 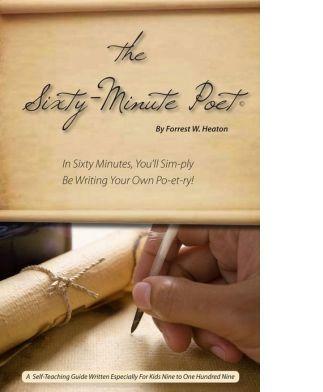 The NC poet and song writer, Forrest W. Heaton, is the perfect guest to start with as he encourages everyone to find and nurture their inner poet. Forrest’s promise is: “You give me sixty-minutes of focused, timed, uninterrupted reading/writing and you will be well on your way to a lifetime of writing poetry, having fun with it, perhaps even getting really good at it.” He states that there is an inherent freedom in poetry, poets are completely free to choose how they express themselves without restrictions from the reader, there are no rules. Not many things you can say that about. Why write poetry? For the pleasure and experience of distilling the essence of thought and emotion onto paper, thereby making it more real and honest, to be shared or not, as desired. Listen in, write your own four line poem to start, and join in as we conclude the hour in song backed by Forrest’s guitar and most excellent singing voice. Find out more at Sixty Minute Poet. This entry was posted in Uncategorized and tagged Forrest W. Heaton.Sara Claytor, NC poetry, NC Poetry Society, poetry, The Sixty Minute Poet. Bookmark the permalink. Pingback: The Sixty-Minute Poet » “The Sixty-Minute Poet” is on the radio!